Diving in Indonesia is a fully comprehensive diving guidebook for exploring the most notable areas of Indonesia. As a scuba diver and underwater photojournalist for more than 35 years, I have traveled to many of the same locations highlighted in this book. Diving Indonesia, although not as extensively as the author, I am always amazed with the diversity and uniqueness of the area. This highly informative and impressive collection of dive destinations and location details forms an invaluable tool in planning and in the diving of this area. The compact fact-packed paperback, with a protective cover, makes it an ideal and valuable traveling companion. This will be the only book I will need on my next adventure to Indonesia. 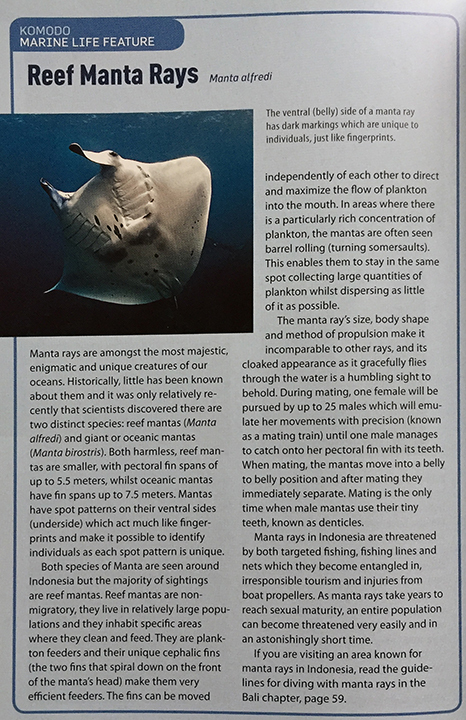 This book is filled with special feature pages describing some of the unique and interesting marine life found in the Indonesia waters, part of the Coral Triangle, the center of the world's biodiversity.